Hi... 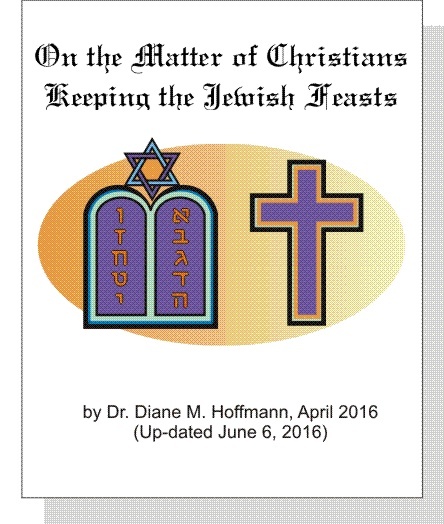 I'm so glad you're here to get your copy of the e-book "On Christians Keeping the Jewish Feasts". It is quite disturbing to see and hear of the interest of this movement picking up increasingly in our country as well as others, and taking on some even more disturbing shapes as you will see in my e-book. It's fine to teach what the old testament feasts mean as shadows of things to come, but it is not right to actually keep the rituals that Jesus Christ, the Lamb of God, fulfilled on the cross through His death and resurrection. Some say that in the Last Supper Jesus is telling the disciples to keep the Passover when in actual fact He is telling them to remember His body and blood that He is about to shed for the sin of the world. I show how a speaker in his message to an audience said that the apostles and Jesus kept the Jewish feasts and therefore we Christians ought to keep them too. However, I went through the whole book of Acts in one session and every time it mentions going to or being at the Jewish feasts (which is just a few mentions in the whole of the twenty-eight chapters), it is clearly connected with the purpose of preaching to the Jews. Actually within the first two chapters, the scripture says, “And they continued steadfastly in the apostles’ doctrine and fellowship, and in breaking of bread, and in prayers.”” (Acts 2:42). It does not say they continued in the Old Testament’s feasts and ordinances. And it says steadfastly – which means firmly, with constancy – in the apostles’ doctrine. There are 11 pages of material giving many scriptures from various books of the Old and New Testaments to answer this question of whether Christians are required to keep the Jewish Feasts (or the Lord's Feasts, as the Jews call them).